This is another popular location for photographers and with good reason. Not only do we have an impressive waterfall, but the brook itself is gorgeous, winding through dense groves of mountain laurel. The falls themselves are natural, but lie below a man-made dam which once held back water for the Wilton town reservoir. The reservoir is non-functional these days, but the pond still fills each spring. At the turn of the 20th century these falls, along with others in the vicinity, were popular locations for picnics, swimming and outdoor relaxation. Now the property is largely host to photographers and snowmobilers. Parking is available in a small turn out and along the road. There are trails on both sides, but the falls are downstream so take that one. A short walk will bring you to them and the roar of the water gets louder with each step. Before you get to the falls it’s worth taking the time to walk up the side trails that lead to the brook above the falls where you’ll discover some really beautiful cascades. Keep an eye out for a large cellar hole on your right as you approach the defunct reservoir. The falls themselves are accessible via a couple of side paths as well, one at the head of the falls just below the dam and another further down which will bring you to the middle of the falls. They are large, sprawling and impossible to photograph in their entirety while staying on public land. You’ll notice houses on the far side so please respect the rights of the owners who continue to allow public access to this beautiful waterway. As you continue downstream you will encounter many smaller tributaries, many of them hosting spring runoff which eventually run dry in high summer. 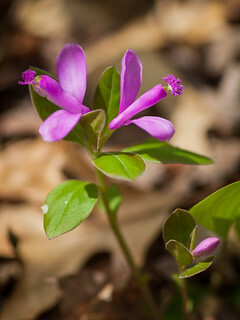 In addition to the water you will find a number of wildflowers including pink lady slipper, painted trillium and mountain laurel. I haven’t explored all the trails, but both sides are worth trekking if you have the time. 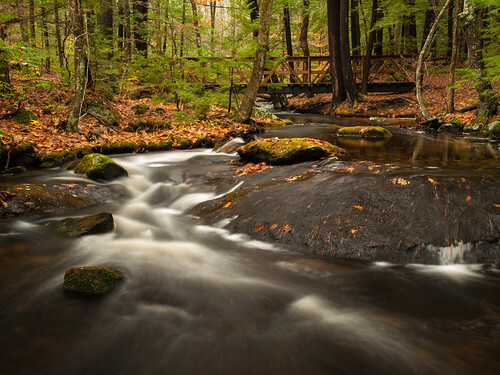 The upstream trail takes you through mixed hardwood forest and skirts a marshy area where Mill brook widens and becomes a valuable ecosystem for wildlife. Even further upstream is the still active Frye’s Measure Mill. Taking its name from its second owner and that it produced measures; vessels made to the exact standards of measures in five sizes, the smallest being one quart, then two quart, four quart, single peck, and one-half bushel. The mills still uses the power of the brook to create Shaker-style boxes. From Route 101 West bear right onto Route 31 and continue through the town center, bearing left onto Burton Highway and left again onto Issac Frye Highway. Parking is just past Putnam Road which is on your left. 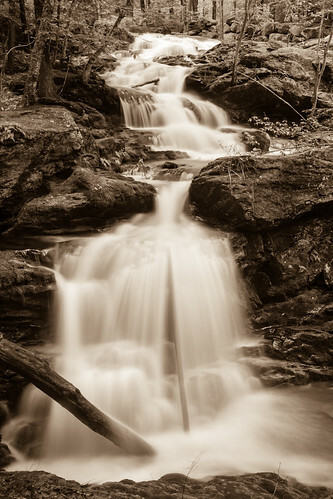 If you’re a nature photographer in southern NH, this is probably a place you know and love. If you’re not and you’ve never been, you’re in for a treat. 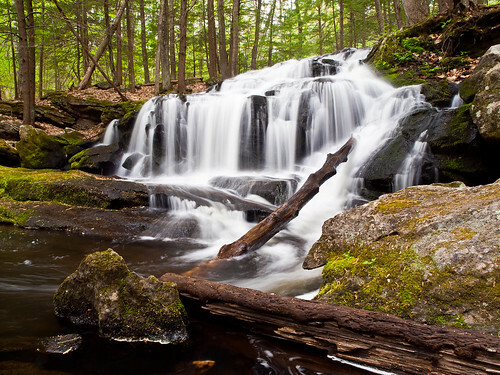 Tucker Brook and the lovely falls are one of several easily accessible falls within a few minutes drive from each other. No matter what season you visit during, there will be something beautiful for you to see. Not only is there a picturesque brook, rich with tannins and the photogenic waterfall, but there are acres and acres of mountain laurel, mixed hardwood and wildflowers like crazy. For history buffs there are 3 mill sites to explore as well. The trails intersect 258 acres and are quite easy to manage although there are some decent changes in elevation here and there. Main parking is on Savage Road in Milford. From the intersection on Route 101 turn onto Phelan Road, which turns into Savage road just past the Market Basket. Continue less than a mile to a turn out/power lines on the left. The sign is well into the woods from the trail to the right. Alternately you can also park on Boulder Drive; continue on Savage Road and take a left onto McGettigan at the intersection. Then a left on Mason and another left on Boulder. Parking is on the side of the road near the trailhead sign. Additional info here and a trail guide with map here. Often when I want to get outside, I don’t want to drive a long way to get there. That’s one of the reasons this web site exists. A preserve that I feel is important, especially for southern NH which can seem awfully crowded, is the Horse Hill Nature Preserve in Merrimack. It is over 500 acres of diverse features including beaver ponds, steep hills, cellar holes, winding brooks and many wetlands. I’ve been there in winter, but spring is when I feel it really shines. Wildflowers proliferate including fringed polygala, wild oats, pink lady slipper and indian pipe (a personal favorite). Sheltering under the mixed hardwood and pines are also many, many ferns. Having been logged many times over the decades, the forest is young and the trees relatively small. That’s why it seems beavers love it there, creating new ponds and trimming saplings all over. 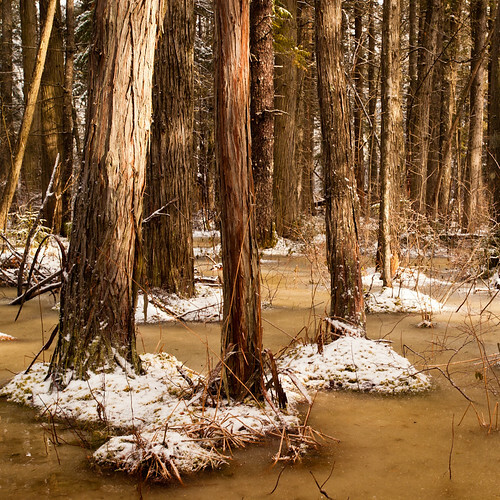 Hidden deeper in the preserve is White Pine swamp which plays host to many water fowl. Motor-vehicles are prohibited on most of the trails, but horses are not. Just be careful of some of the bridges – there are signs warning that they may not be safe for your mount. Also, if you’re planning to hike the Loop Trail, give yourself a lot of time and when you cross back over the power lines, continue along that path (to the right) until the Loop Trail sign appears on your left. I’ve missed it a few times and ended up with a much shorter outing than I’d planned. Other than this bit, it is well signed, blazed and posted. There is also plenty of parking on Amherst Street. Additional info here and check out the map and trail guide here. Tucked into a much larger network of some 15,000 acres of protected land, the Loverens Mill Cedar Swamp preserve provides another opportunity to get up close to the rare and always beautiful Atlantic White Cedar. Even though its much farther for me to drive, I like this swamp because it has fairly extensive boardwalks that allow deep access to the swamp (although some of them were in need of repair the last time I went out). Stewarded by The Nature Conservancy, I attended a botanist-led walk through the swamp that taught me a lot about the symbiotic relationships that exist only in an Atlantic White Cedar Swamp; most prominently with the Hessel’s Hairstreak butterfly which cannot survive without it. 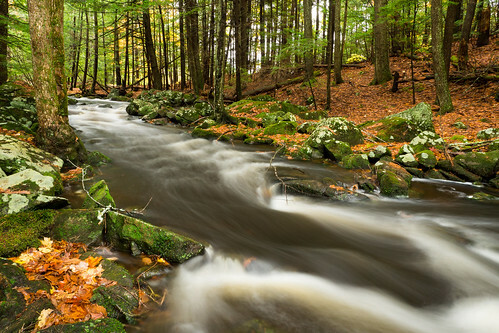 In addition to the swamp, there are trails that take you along the North Branch of the Contoocook river, one of the most beautiful rivers in New Hampshire. As the name implies, there was a mill on this site, lately named Loverens and originally built in 1798. Over the years the mill (under different ownership) produced staves for buckets and barrels, shingles, siding and other building products for nearby towns. As you continue to follow the river upstream you may get lucky and get a glimpse of the resident otters. 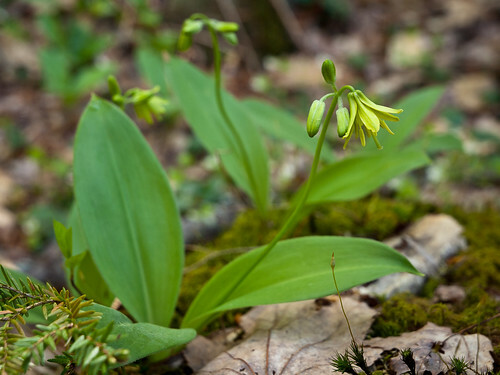 Wildflower lovers will rejoice here in spring where you’ll find bluebeard lily, sheep laurel, pink lady slipper, trillium, goldthread and more. In the swamp there are dense stands of cinnamon fern and the peat moss mat is thick and lush. Please take care not to step off the boardwalk though as you can seriously damage the peat layer. From Route 9 between Routes 123N and 31S, turn north on Loverens Mill Road, cross the bridge, and park in the area on the right. The preserve is located along a dirt road across the road, and slightly north of the parking area. It is marked by a sign. Follow this road 0.25 miles to the preserve trailhead, which is marked by a sign. Additional info here and trail guide with map here. Black gum swamp – these trees are some of the oldest and rarest in New England. Surface streams – non- or barely tannic, these streams play host to frogs and other wildlife, occasionally slowing and widening into ponds. Kettle bog – also known as Mud Pond, this is a typical kettle bog hosting many distinct plants such as tamarack pine, black spruce and pitcher plants. There is a small boardwalk and a screened in house which is not ideal for viewing, but a relief from insects. 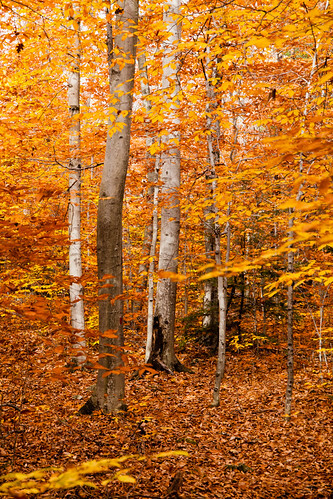 Beech groves – the Ridge trail will bring you into one of the largest beech groves I’ve seen, especially wonderful in the fall when they’re at their golden best. Family cemetery – with only five markers, the Gearry graveyard is tiny and picturesque. 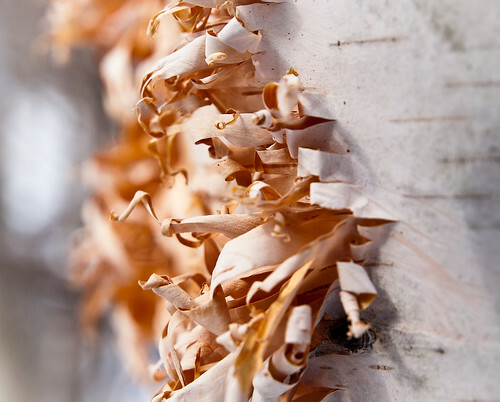 Tree identification trail – a great way to learn about the many trees growing here and in other New Hampshire forests – includes some amazing Douglas Firs. Tons of wildflowers and ferns – lots of Christmas fern and many species of wildflower including purple and painted trillium, bluebeard lily, lady slipper, jack-in-the-pulpit and wild iris. 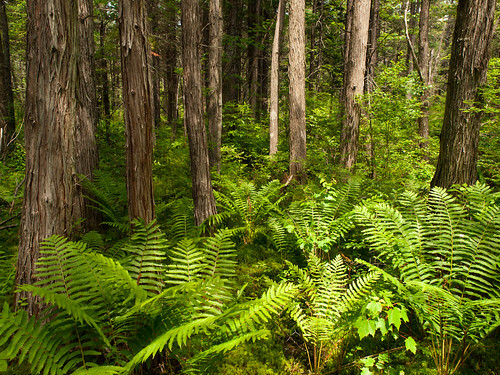 Unlogged, virgin forest tract – this small strip of unspoiled forest hosts some enormous hemlocks. American chestnut restoration – the Fox Forest is one of a select group of sites participating in a controlled project aimed at producing trees capable of resisting the disease that nearly wiped out this entire species in North America. If you’re a fast hiker you can probably walk most of the trails in a single day, but if you’re a photographer or like to really explore it will take you a few days to cover it all. There is a handy information kiosk by the parking area with great maps and information about what projects and initiatives are underway. Please pay attention to trail closures! 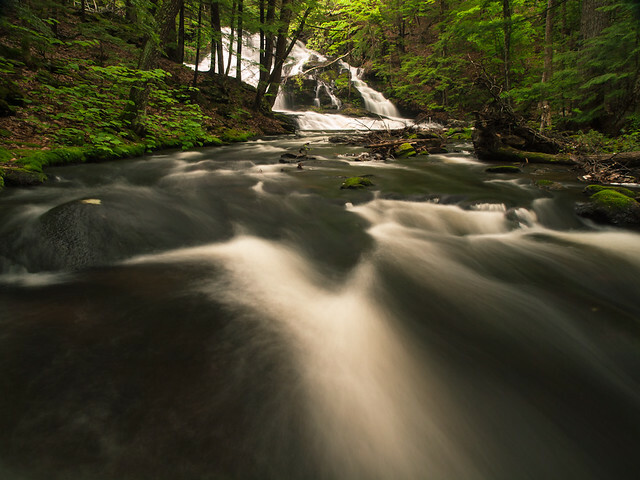 Also you can attend the Cottrell-Baldwin Environmental Lecture Series which is hosted at the Fox Forest headquarters and is co-sponsored by the NH Division of Forests & Lands and the Society for the Protection of New Hampshire’s Forests. For more info call (603) 224-9945. The 2015 spring schedule is on the link below. From Route 9/202, turn onto Center Road past a small downtown, schools and a large orchard and farm. There is a sign on the right and ample parking. The work of the glaciers that covered New Hampshire during the last ice age is apparent all over the state, mostly in the form of exposed granite ledge and boulders ranging from the size of bowling balls to your house. One of the more subtle features left behind by the giant walls of ice are kettle bogs. There are a few still left in New Hampshire, but none more accessible than the Audubon Preserve in Amherst. 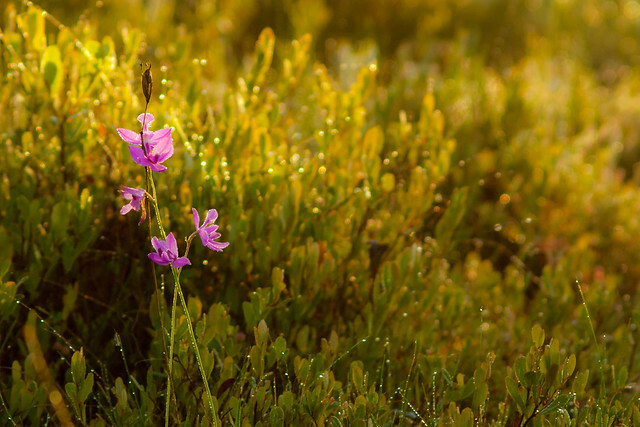 A kettle bog is named for its basic shape and they are delicate ecosystems that host plants that do not thrive in any other environment. They are formed during the glacial retreat when enormous chunks of ice separated from the main sheet and became stranded. As they melted they made large depressions in the earth that filled with the melt-water. Over the centuries, that water was added to by rain. Unlike other ponds, kettle bogs get water from no other source except precipitation and they have little or no outlets for runoff, creating a nutrient-poor environment. Eventually, bogs fill in with vegetation, most notably peat moss, that accumulates on its borders. The Ponemah bog is thought to have been formed 12,000 years ago and its central pond has been reduced to 3 acres. The plants that have adapted to live in bogs are fascinating and beautiful. Most notable are the carnivorous plants such as pitcher plant, bladder wort and sundew. 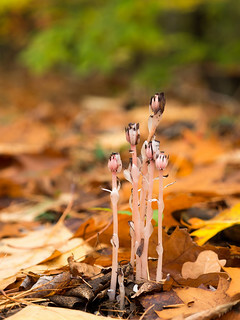 Because the soil has so little nutrients, the plants rely on insects and other small invertebrates to survive. Also present are bog rosemary, rhodora, tamarack pine, black spruce, bog cotton, leatherleaf, blueberry and grass pink orchid. 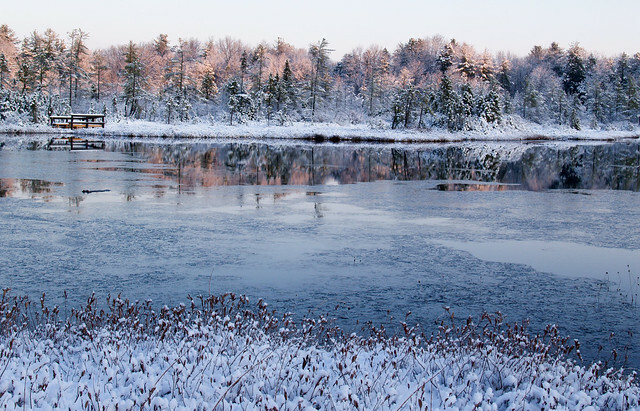 The preserve is beautiful in any season, even winter. There are often geese, ducks and heron in the pond and if you’re stealthy you can spend a morning with them as I have done once or twice. The trail begins in woodland but soon emerges into the bog proper and follows narrow boardwalks. Please be careful to not step off them, not only because the peat mat is deceptive in covering deep water, but also because it’s very fragile and takes decades to repair once torn. There are three viewing platforms on the pond and another off a side trail. They’re perfect spots for sitting quietly listening to the many songbirds that call the bog home including tufted titmice, chickadees and woodpeckers. There is an informational kiosk detailing the features of the preserve and a picnic table. Trail guides are often available or you can download one here. From Route 3, Everett Turnpike take exits 10, 11, 7 or 8 to Route 101A west. Turn left onto 122N at the intersection and then take an immediate right onto Stearns Road. Drive 1.1 miles to Rhodora Drive on right and drive straight ahead to the parking lot.